Photo Credit: Green City Growers. Heads of lettuce may not seem life changing, but when you grow 3 million of them each year, the result can reinvigorate an entire area. Such is the idea behind Green City Growers Cooperative’s greenhouse in Cleveland. 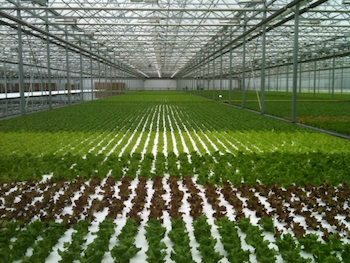 At three-and-a-quarter acres, the greenhouse spans the equivalent of three football fields. “It’s one of the largest local food initiatives in the United States,” said Mary Donnell, Green City Growers’ chief executive officer. 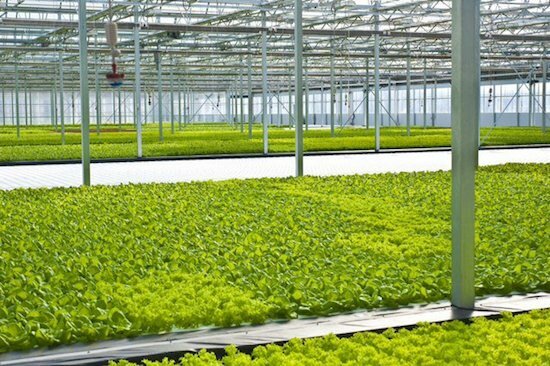 It also ranks as the nation’s largest food production greenhouse in a core urban area. Green City Growers Cooperative is a for-profit, worker-owned company that operates under the umbrella of parent company Evergreen Cooperatives. Although working at a grass-roots level, the organization has a highly structured, corporate management system with boards of directors and layers of chief executive officers. Evergreen, launched in 2008, operates two other green businesses besides Green City Growers — a laundry company and solar-energy company. It aims for “building businesses, hiring from the neighborhoods where they’re located and then distributing profits back to employee members over time, which would help build financial assets and help transform lives and transform neighborhoods,” said Donnell. Each business operates independently, with its own financing and management. The idea for the economic revitalization project began when local institutions, including the Cleveland Foundation, University Hospitals, the Cleveland Clinic and Case Western Reserve University, began meeting to discuss area poverty, said Donnell. After realizing that the surrounding neighborhoods housed 43,000 residents with a median income under $18,500, the institutions came together to figure out how to use their buying power to create jobs. Cleveland is historically supportive of the local food movement, said Donnell, and founders saw opportunity in the ability to provide local food year round. Donnell, who helped create the University of Ohio’s hydroponic operation, joined the project when she was asked to write the feasibility study for the hydroponics operation. Her background in produce sales, marketing and management, along with master’s degrees in both horticulture and business administration provide a strong background to help Green City Growers meet success. Because of the involvement of prominent local organizations and their plans to improve the lives of low-income residents, Green City Growers won significant amounts of grant money to pay for start-up costs and expenses until the operation turns a profit. Business plans call for a profit in 2014, and Donnell said the operation has enough capital to last through then. Funds for the $17 million project came from the U.S. Department of Housing and Urban Development Section 108, which offers Community Development Block Grants, and Brownfield funds, also through HUD, leveraged through new market tax credits. The federal tax credit program is designed to attract capital into low-income areas. “Typically HUD funds are not used for an agriculture project, but in this case it was a fit for where we were and the size of the project,” said Donnell. The hydroponic greenhouse planted its first seeds on Dec. 12, 2012, harvested its first plants in January, and now employs 25 worker-owners from the surrounding low-income area. Plans call to eventually employ 42. To teach residents how to farm, Green City Growers employs an experienced greenhouse grower, along with a personnel manager to supervise staff and production. Once the greenhouse is profitable, those profits will funnel back into the hands of the worker-owners, who will then support other local businesses. Donnell said Green City Growers elected for a hydroponics operation because it offered freedom from soil-borne diseases, efficiency and year-round growing potential. The operation doesn’t use pesticides, and employs sustainable methods of pest control, such as beneficial insects and integrated pest management. In addition to growing lettuce, it harvests 300 pounds of herbs per year. Crops grow on a float-bed system. “The plants float on shallow pools of nutrient-rich water,” said Donnell, adding that they use conventional greenhouse fertilizers. Green City Growers sells to grocery stores and food service companies within a 50-mile radius. “We are at such a scale that we need big customers,” said Donnell, explaining why the operation avoids farmer’s markets and community-supported agriculture programs.